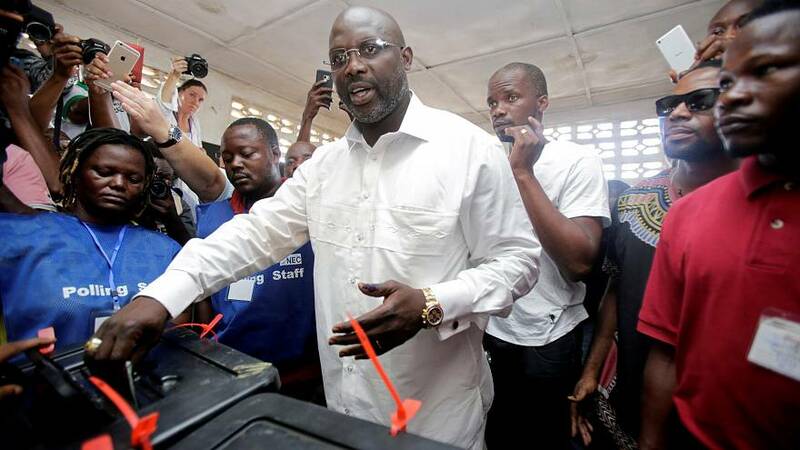 Liberian ex-football star George Weah has taken a lead in partial results released by the country’s electoral commission from Tuesday’s presidential and parliamentary elections. Weah leads with about 43 percent of the nearly 30 percent of results released. Vice President Joseph Boakai has polled about 25 percent of the results released so far. The electoral commission released the partial results in spite of a threat of legal action by Liberty Party which had cited irregularities in the polls. Chairman of the Electoral Commission, Jerome Korkoya urged parties with complaints to seek redress through the appropriate channels and also asked the political parties not to rush into conclusions about the results. “It is important to point out that results published by the National Election Commission are the only official results. The commission asks all other organisations to refrain from announcing anything other than the official results released. Candidates and political parties should also be patient and await the official result and not rush to premature conclusions. The commission is committed to the timely release of results, but this cannot be done at the expense of accuracy. These results are not verified by the commission, this can lead to problems and expectations that cannot be met,” he said. Since Wednesday, social media has been flooded with congratulatory messages for George Weah, the ex-Liberian football star considered a frontrunner in the October 10 polls even before the release of Thursday’s partial results. Final results from the polls are expected by October 25. A run-off will be held next month if no-one has won a majority. Outgoing President Ellen Johnson Sirleaf, who became Africa’s first elected female president when she won a surprise victory in 2005 following a post-civil war transition, hailed the election as historic. “We believe that all Liberians are ready for this process. I thank them for participating in this process,” she told reporters. Liberia, Africa’s oldest modern republic, was founded by freed US slaves in 1847 but its last democratic power transfer occurred in 1944.